1. Characterized by approval or support; positive: "He received a favorable report regarding the completion of his project." 2. Creating or winning favor; pleasing: "She made a favorable impression." 3. Affording advantage, opportunity, or convenience; advantageous: "Her father has a favorable position in his company." 4. A reference to a request resulting in the granting of what is desired. 5. Boding well; propitious: "The signs are favorable for a new start." Capable of producing gradual chemical changes in which bacteria, yeast, etc., change sugar into alcohol and produce carbon dioxide: Yeasts are one kind of fermentability that can change certain foods into alcohol. Some fermentabilities result in alcoholic beverages; such as, beer, wine, and whiskey. Pertaining to the decomposition of organic compounds: There are fermentable changes that take place when glucose is converted into ethyl alcohol through the action of yeast or bacteria. Yoghurt is a result of fermentable milk with bacteria. Wine comes from leaving fermentable grape juice to chemically change when all of the sugar has turned into alcohol. 1. Relating to something which can be established or rendered firm: Tom pitched a tent, but it wasn’t secure; so, he decided to try again and, since it was fixable, he pounded the stakes into the ground a second time. 2. Capable of being repaired or restored: Since there was only a minor problem with the coffee machine, the company thought it was fixable and so they quickly repaired it. 1. Easily set on fire; combustible; inflammable. 2. Easily ignited and capable of burning rapidly. Pertaining to something which is capable of being set on fire and of burning quickly: Gasoline is a very flammable liquid. Easily excited, aroused, or angered: "Roy had an inflammable temper when he felt he was being wronged" is a proper usage, but it should no longer be used with reference to something that will not burn. The word inflammable actually means "able to burn"; while "nonflammable" means "unable or unlikely to burn". The prefix "in-", used with inflammable is an intensifier not a "negative" as with such words as "inhospitable", "inhuman", "insensible", "indecent", "inadequate", etc. It has been a mistake believed by many people that inflammable meant "not flammable" and some serious injuries resulted over the years because of this misunderstanding. As a consequence, many English-speaking countries passed laws that have required manufacturers of materials and substances that burn easily to use the word "flammable" in place of inflammable, which is considered less ambiguous or confusing. So remember that inflammable comes from "inflame", which, in this case, means "to set on fire" and not from "in-", "not" + "flammable", "combustible". Descriptive of something that is not readily ignited and so it does not burn easily: It is much more realistic that people use nonflammable or non-flammable instead of inflammable when they mean that something cannot burn or is very difficult to burn. In the confusion at the store, which was caused by a customer's inflammable temper, Joseph was unable to read the sign to see if the can of solvent was flammable or non-flammable. Capable of being woolly or flocky. 1. Capable of frequent and irregular changes. 2, Able to make a variety of movements or actions. 1. Descriptive of something which is difficult to deal with or to overcome: Preparing for war is a formidable task for any country. 2. Relating to something which inspires respect or wonder because of size, strength, or ability: Shirley exhibited a formidable display of skill whenever she worked with her computer. 3. A reference to the anxiety of fear, dread, or alarm: A fratricide, or the killing of one's brother, became a formidable concern by the killer's sister because the murderer still had not been apprehended by the police. 4. 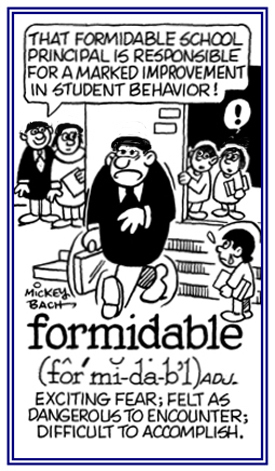 Etymology: from Latin formidabilis from formidare, "to fear, to dread". © ALL rights are reserved. Showing page 15 out of 43 pages of 633 main-word entries or main-word-entry groups.